on all appliance purchases $799 & up with your Conn's HomePlus HOME Credit Card** between 4/14/19 & 4/20/19. Equal monthly payments required for 24 mos. until paid in full. Now is the perfect time to say goodbye to that loud, banging washing machine, or tedious trips to the laundromat, with a new washer from Conn’s HomePlus! We offer a large selection, and our appliance financing makes it easy for you to pay over time with affordable low monthly payments. Front-loading washers, top-loading washers, twin-load washers and washer accessories — at Conn’s HomePlus, we’ve got them all. Designed by top brands such as LG, Samsung, GE, Whirlpool and Maytag, our washers come in a range of colors and finishes, including stainless steel, black stainless steel, white, black, blue and red. 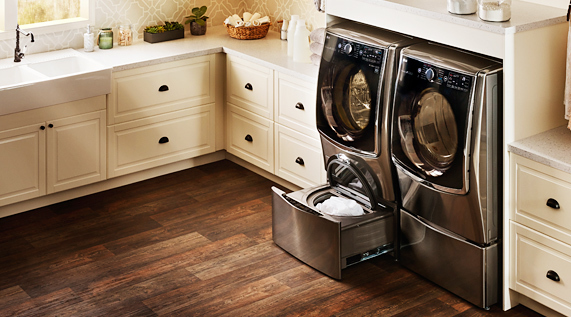 Choose an energy-efficient model or pick a washer to match the dryer you already own. When you find the model that’s right for your home, you can apply for your YES MONEY® financing easily and conveniently online.